Twyla Tharp has always been slightly ahead of the curve and outside of the pack. She has forged an unconventional choreographic career, along the way treading post-modernism, jazz, ballet, Broadway, vaudeville, and myriad points in between. Her current run at the Koch Theater, presented by the Joyce Theater Foundation, draws from all of these genres to embody her fluid, pigeon-hole resistant, utterly distinct style. The two premieres mark the complexity of her dances, and a reduced version of the duality of her creative output. Preludes and Fugues, to Bach, is the more balletic and classical of the two. The women are in soft slippers, already a radical idea given their pedigrees (two hail from New York City Ballet), because pointe work is an irresistible tool for so many choreographers, given the chance. But it gives the women a better chance at dealing with the speed and torque that Tharp builds into her restive passages that explode from a hovering stillness into sheer kineticism in a split second. Tharp doesn’t shy from traditional gender roles that basically acknowledge physical size differences—men slowly pressing women overhead, showing the brute difficulty of the move, or a man swinging a planked woman to and fro between his legs. The NYCB women—Savannah Lowery and Kaitlyn Gilliland—are as tall most of the company’s men. But when her style veers toward the pugilistic, the men appear far more comfortable, as it is less of a stretch for them to spar and jog athletically than the women, trained to never be ungraceful. The action morphs from pairs to groups to solos, driven by an irrepressible energy that rides atop the shifting dynamics of Bach’s short compositions, or sometimes beside it or underneath. Sometimes it’s literally, as when they pogo-hop to a bouncy line. To layered piano arpeggios, the company splits the stage in half in mirrored symmetry, pealing out of lines like petals blooming. Bravura moves end in suspended releves, and small gestures add a touch of humor to these skilled show offs, who wear Santo Loquasto’s gold and jewel-toned outfits. They can leap offstage in a split, or dissolve a similarly heroic passage in a relaxed walk, as if in rehearsal. Tharp’s sheer audacity is mind-boggling, not to mention the level of technique and precision, or sometimes casualness, demanded of her dancers. Yowzie is the flip side of Tharp, bringing into play drunkenness, mayhem, and clashing colors to a suite of American jazz tunes (recorded, as was the Bach). A fragile romance between Rika Okamoto and Matthew Dibble may have been the result of beer goggles, and we see them wobble woozily through the infatuation phase before parting ways. Okamoto, spurned and presumably regressing, adapts simian behavior, revealing a comic gift (her dejected full-body slump is hilarious). All the dancers in this piece get the chance to display their rubber-limbed best, bouncing off one another or dropping with dead weight into splits. Ron Todorowski, sporting glasses, slices precisely and thrillingly through Tharp's challenging steps. The exceptions are Gilliland and Lowery, wearing midi dresses and sun hats, who swan as elegantly as possible through the riff raff. Loquasto’s costumes here are riotously colored and tie-dyed, and topped off with headpieces. While he certainly knows how to fit and finish costumes for these dancer-athletes, I suffered from visual overload, in addition to a quasi-psychedelic backdrop. 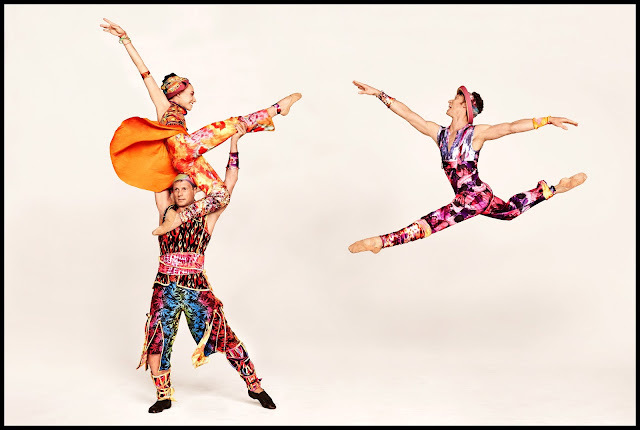 But the program’s mix of high- and low-brow certainly showed off Tharp’s imaginative and sui generis choreography. Chances are if you liked one, you cared less for the other. But a full evening of premieres is a rare, choice chance to glimpse one of the best hard at work, doing her own thing. Twas ever thus for Tharp.